The JEWEL Network (TJN) is a science news network specializing in broadcasting the sciences of life and living throughout the 21st Century and BEYOND! Since 2009, TJN has provided a solid base of scientific information to the public, assisting HUEmanity™ in its journey through this exciting and swiftly changing time. JEWEL is an acronym for Justifiably Enchanted With Enlightened Living, and we are here to create a JEWEL culture where learning about the science and technology of who you are as an immortal being is comfortable and part of your every day life. Dr. 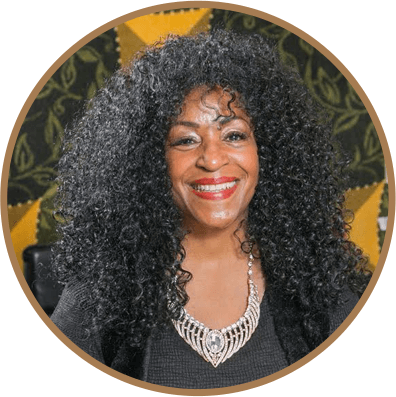 Jewel Pookrum, MD, Ph.D., MFS is the founder of The JEWEL Network, and is a Master Physician and Wholistic™ Healer in Mind/Body Medicine. The JEWELl Network (TJN) radio show is home to some of the most prolific, forward thinking minds in the world of science. Here, you will learn a wide range of subjects - including: neurobiology & brain development, immunology & health, subtle anatomy, metaphysics, melanology, natural time, and much more from world renowned minds on these subjects! The J.E.W.E.L. 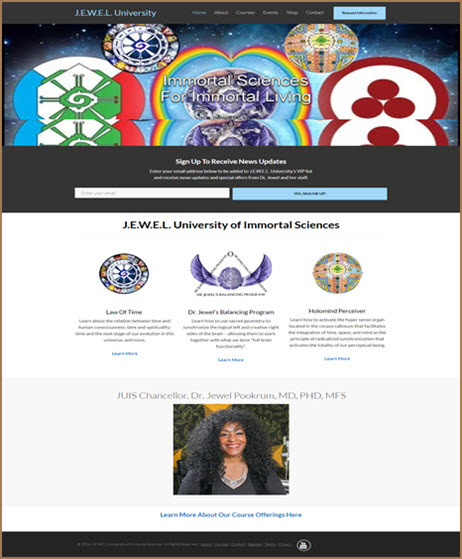 University of Immortal Sciences For Immortal Living (JUIS for short) is an intellectual center that teaches the didactics of how to apply and identify the technology in the self – your physical body, mental body, emotional body, soul body, and spirit body – and use it. JUIS is where you go for series self-enlightenment. This university will make sure that the laws of evolution are clearly stated, and the significant characteristics that are part of the human avatar are presented to you in a concise scientific method for you to be able to grasp. The honor JUIS will bestow on you for your willingness to study yourself is recognition of development and expansion in consciousness by receiving certifications in the genuine knowledge of what you learn. JUIS will stand behind you and say that they know that you can do this, because you also have had to demonstrate to yourself that you can do the things that are taught. If you want to commit to learning the hard-cold facts, apply it, and receive recognition for your demonstration of it, then this university is for you.